Arriving on the Champes-Élysée at 1pm, I was both surprised and shocked to see so few spectators cueing up for the day ahead. Sure, Norwegian corner was roaring and ready to go and road blockages were firmly in place for cars and pedestrians alike but there was a significant lack of support on the side of the road. 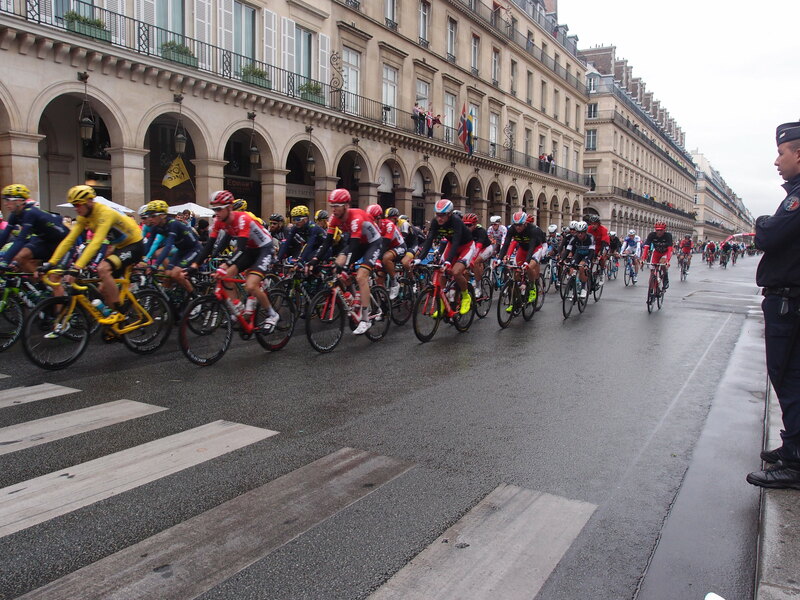 1km to go in the 2015 Tour de France. 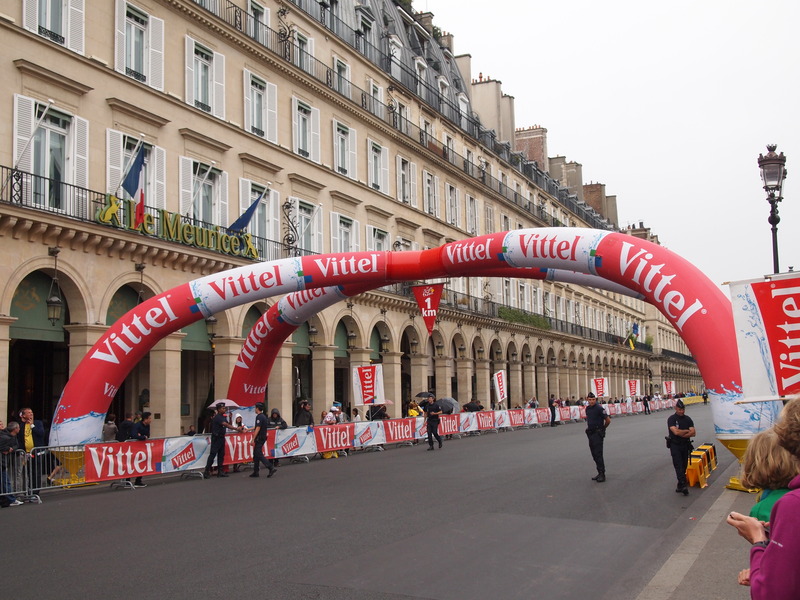 Unable to get further down the course than the Rue de Rivoli, we set up 200 metres from the 1km to go mark and firmly stood our ground as passersby inquired about the commotion, took photos of an empty street and vented their anger at the metro being closed off. As the day progressed and the rain and wind set in, a few loyal viewers on either side of the course huddled under broken umbrellas and raincoats to shied themselves from the cold and wet. 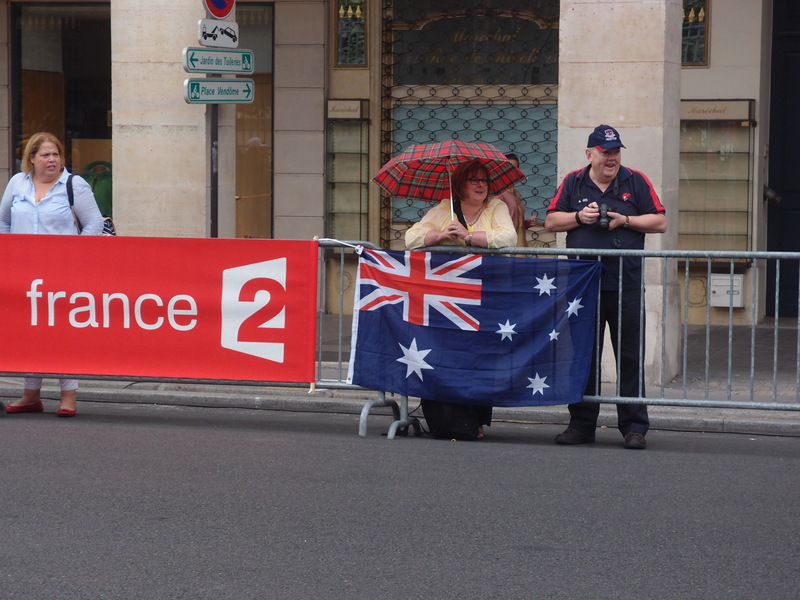 Two Australian spectators setting up early before the wind intensified and the rain set in. 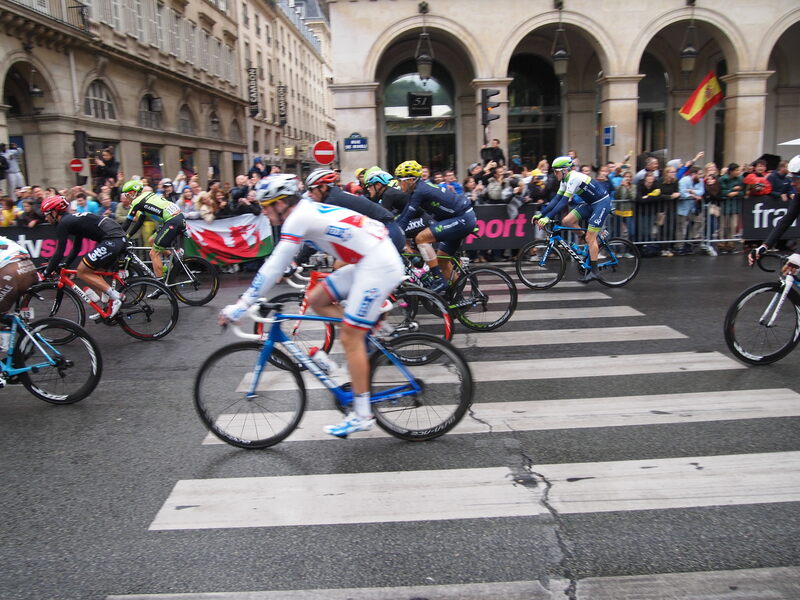 As the women’s race came to a close – showing some fantastic cycling with a real fight to the finish – spectators came and went as their Parisian impatience let them down. Unfazed by the piles of rubbish blowing onto the course, the French Police stood their ground, firmly not caring about the spectacular event taking place around them. The women take charge of the course. Three o’clock, four o’clock, five o’clock and six o’clock all went by as we continued to stand, cemented on the fence line, firmly in a puddle, shivering for the main event. The caravan with little more than a wave flew through; wet, cold and tired and we continued to wait. Finally, after hours the first sign of head lights came around the corner. For the next hour, we fought for our spot as late comers tried to claim the prize. Zooming past, the riders came, then went, then came past again, then went again. A purely ceremonial stage of the tour, with the exception of the last lap for the sprinters, the race was fast – moving so fast your eyes just can’t focus – but uneventful with riders chatting at the back of the peloton, waving to spectators as a team and forming a long train down the course. 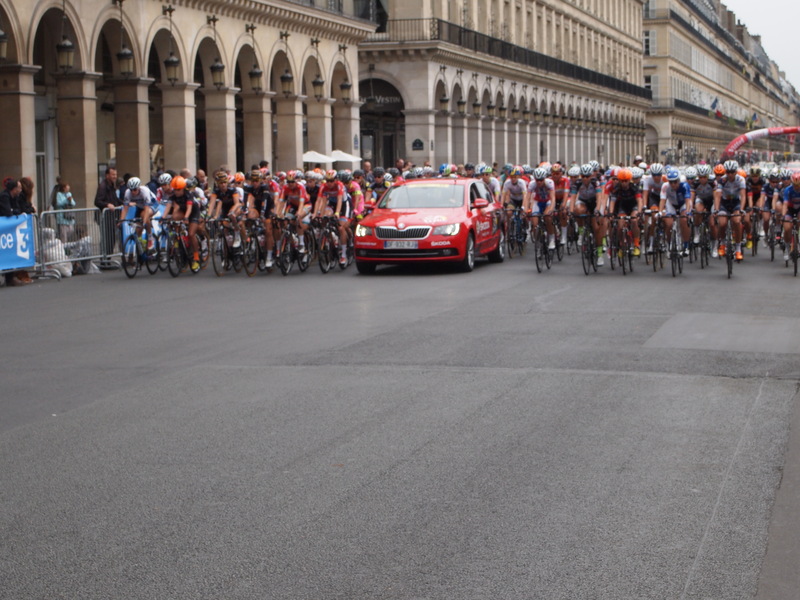 The first of 10 laps of the Champes-Élysée. 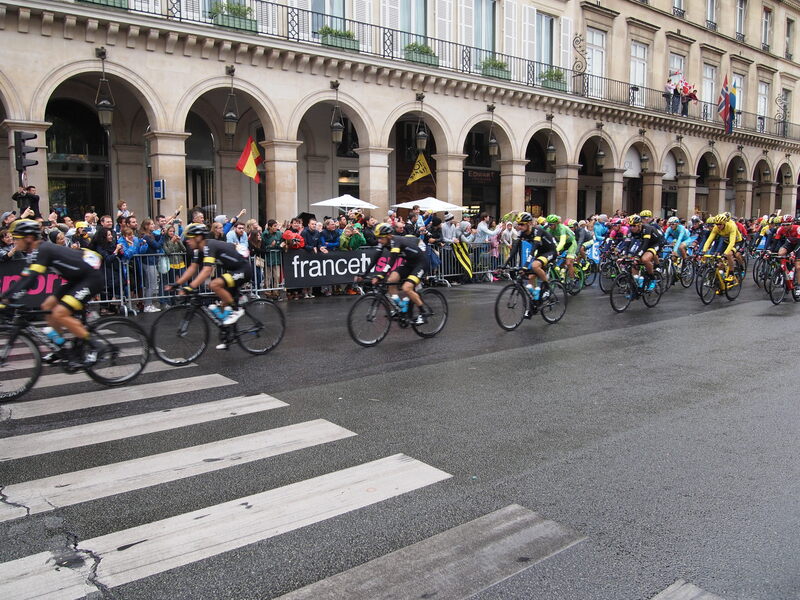 Team Sky dominate the front of the peloton on lap five. Then, it was all over. 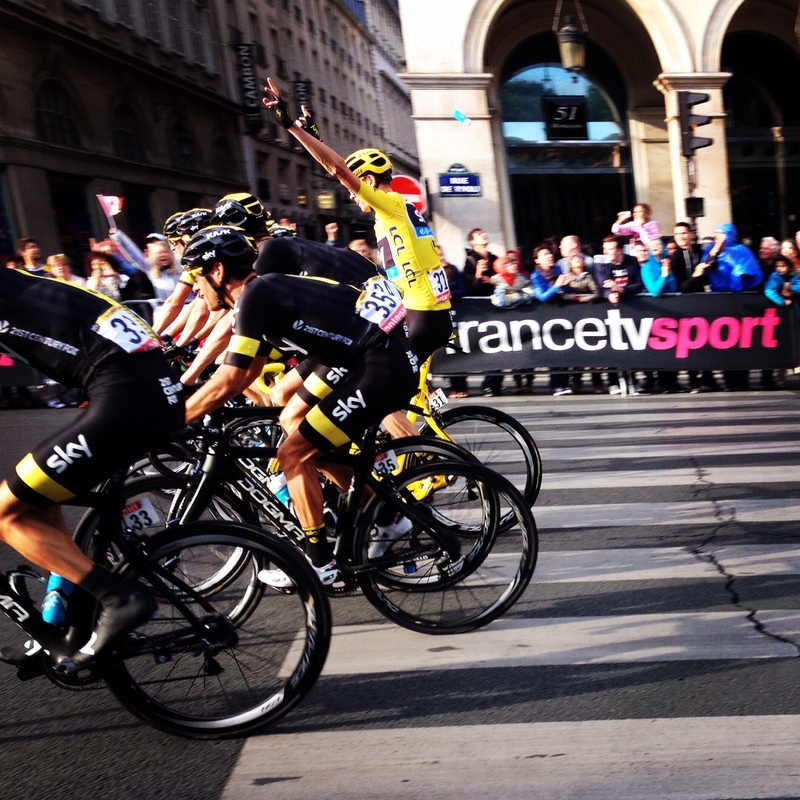 Team Sky make their way toward the finish line of the 2015 Tour de France. ← Le Tour de France 2015: Stage 19 Saint Jean de Maurienne to La Toussuire Les Sybelles.